I'm taking advantage of my day off and spending it in my craft room, love these days! 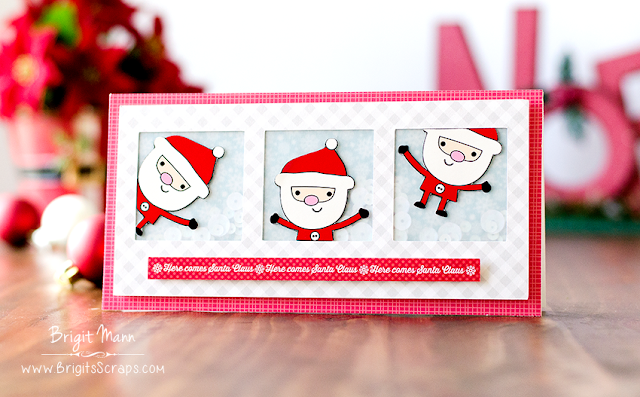 I have another card to share using some paper and a cut file from Doodlebug Designs Here Comes Santa Claus collection. I bought the Here Comes Santa Claus svg set from Lori Whitlock, I love how they are all pieced together already so it makes doing a print n cut so simple which is what I did with the Santa. I cut them out with my Brother ScanNCut 2, I didn't want any white around them so I cut to the edge. For the shaker I used vellum instead of clear acetate, I wanted a soft snowy look in the back. I thought this border strip was perfect as the sentiment, it's from the 6 x 6 pad. I love the simplicity of the card so I didn't want to add anything else to it. This is adorable my friend!